Washington (CNN) – Energy giant BP has hired a Washington-based, bipartisan political consulting firm to produce its new aggressive national advertising push, including a national TV spot released Thursday, CNN has learned. The sources say that BP hired Purple Strategies to produce what will likely be a series of advertisements as part of BP's attempt to rehabilitate its battered image. The television ads, running on national cable and broadcast stations, have the same tag line as the full page print ads running in major newspapers: "We will get this done. We will make this right." 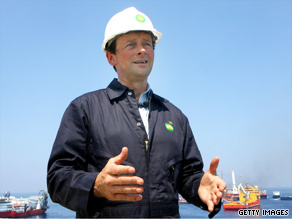 In the TV spot, BP CEO Tony Hayward narrates, saying "to those affected and your families, I'm deeply sorry. The Gulf is home for thousands of BP employees and we all feel the impact." One of the sources familiar with the advertising strategy says BP executives want to make clear they know it's important for people to see and hear that the company understands the magnitude of the oil spill, and the effect it's having on people's lives, livelihood and the environment. The fact that BP decided to go with an advertising firm led by experts at political campaigns, rather than the traditional "Madison Avenue" corporate advertising firm, is noteworthy. Even before the oil spill, BP had beefed up its Washington presence, spending more than $3.5 million in the first three months of this year on lobbying, according to the non-partisan Center for Responsive Politics. The lobbying firms working for BP are among the most influential in Washington, including the Podesta Group (headed by Tony Podesta, one of Washington's top lobbyists and the brother of former Clinton Chief of Staff John Podesta) and the Duberstein Group (headed by former Reagan Chief of Staff Ken Duberstein). They were originally hired to represent BP's interests as major energy and financial legislation moves through Congress. However, sources involved in BP's lobbying efforts, say that since the April 20 oil rig explosion, the lobbying firms have had an all-hands-on-deck approach in trying to help BP deal with the myriad of congressional inquiries. Another source familiar with BP's communications strategy says the company also hired local public relations firms in the four affected states. Castellanos and Rosen are both CNN political contributors and Republican strategist John Feehery, who frequently appears on CNN, is also involved in BP's communications strategy relating to the oil spill. Instead of spending a pile of money on trying to make themselves look good again, why don't they spend that money on trying to clean up the mess they created. Actions speak louder than a lousy commercial. Excellent – all hands on deck. Why are we giving $69 Million to BP? Great Britian is going to spend $40 Million on Prince Williams Wedding? Could someone please help me with this math? I am watching John King right now and I can not believe this is happening. Less on advertisement and more on fixing the current problem will win me over. The more I hear about fixing BP image, the more infuriated I get. They don't need to spend millions on advertisement to win me over; they simply need to tell me what's going on and show me they are cleaning up their act. Neither of which is happening. If this PR campaign works, Purple Strategies are the guys Obama needs to hire to try and spin his administration as fiscally responsible before the next election. This whole "BP Really Cares" thing will just be a warm-up. Enough of the drama wearing your hard hard and jumpsuit Tony. Who you fooling? Just stop the spin and fix the mess you left. Sorry folks, but this is like having an official spokesperson. They're getting teams of writers in and having them create appeals from the heart that appeals to the heart. I don't buy it. Look, BP messed up in a big way, from what I've read and sympathy isn't going to repair what has happened and will happen. I don't know what BP has done, other than what I've seen on the moving picture box (TV) and to be honest, I don't have a better idea. If anyone does, please bring it up. As for the damage to the Gulf and the surrounding states I do wish you the best and am doing what I can. Here's what I want. Offshore drilling needs to have a die hard quality assurance program that makes it controllable. Notice I didn't say safe, and there's a reason. Oil drilling isn't safe and don't make yourself believe that it is. Protocols need to be followed. Safeguards need to be in place at all levels of drilling and they need redundancy. Do we need other means of national power? YES... But we need to make what we have works too... We are a nation of rush. We jump before if we know the chute was packed right. SO........... Castellanos & Rosen are BOTH involved with BP's communication strategy! Could it be that it IS the GOP, who is responsible for blaming President Obama for BP's disaster? I smell a rat! Thanks for the sincerity, now get the [heck] off our airwaves, twit!